Wildfire smoke sets the sunset ablaze. © James A. Weythman, 2011. If you tried to access RealAstrologers earlier today, you got a scary black screen with a message that my server had been hacked. With the Sun and Mercury in early Libra, we’ve got an approximation of last summer’s cardinal T-square. Fortunately, there are some major differences this time, but we’re in for a wild ride nonetheless. If the approach to Tuesday’s New Moon in Libra feels like Mercury retrograde, there’s a reason. Monday starts out with Mercury opposite Uranus, which sometimes is described of as a “higher octave” of Mercury. You might think of him as Mercury on steroids. Actually, in ancient mythology, Uranus represented primal air, a sort of “Father Sky.” In Greek mythology, he was the great-great-grandfather of Hermes, the equivalent of Roman Mercury. When these two get together, there’s no end to the mischief they can make. As sky god, Uranus rules winds and electrical storms. And wouldn’t you just know it – as soon as I was able to get back into my admin page this morning (thanks to the swift and talented staff at my hosting service, InMotion), the wind started howling, briefly knocking out the power to my modem. Yeehaw! The big event this week is the New Moon in Libra on Tuesday. You can easily see the T-square, with the Sun, Moon and Mercury opposite Uranus, all square Pluto. Although you never know what you’re going to get when Uranus is in the picture, it’s a safe bet that we’ll see storms of all kinds, whether political, social, economic, meteorological or any other category you can think of. Libra is the relationship sign, so don’t be surprised by a flare-up or two in your personal dealings. It’s the next step in a long process we’ve been going through for more than two years. Now, if you ordered your StarGuide 2011 Fall Forecast, you’ve already read that I foresee progress at this New Moon despite the difficult planetary lineup. The difference between this alignment and last summer’s T-square has to do mainly with who’s not in this picture – namely, Saturn. He remains in Libra and in fact is conjoined by Venus later in the week (more about that in a minute), but he has advanced well beyond the T-square degrees. His stand-ins, the Sun and Mercury, aren’t nearly as heavy and restrictive. Moreover, we have a couple of outs here. First and foremost, the Sun, Moon, and Mercury are in an applying sextile with Mars, which will be exact on Thursday. Mars is the action planet, and in Leo he’s free to express himself. For you, that means channeling excess energy into creative projects and anything that fulfills your life’s purpose. This juice is too good to waste, so think now about how you can get maximum mileage out of it. Second, there’s a trine to Pluto from Jupiter in Taurus. It’s fairly wide, and Jupiter is retrograde. Nevertheless, this is a tangible outlet, at least for setting the stage for future rewards. Of course, this means that Mars is in conflict with Jupiter and sharp discord with Pluto (inconjunct with Pluto on Monday, square Jupiter on Sunday). My read on this is that you can take advantage of one of the outs I describe above, but not both. If you try to do too much, you’ll lose ground on all fronts. If you can’t decide where to expend your efforts, see where these planets are in your chart by house and what aspects they make with your natal planets. In terms of mundane astrology, it likely will manifest as world leaders going head-to-head and creating nothing but a lot of static and hot air. On second thought, that’s not news. The Sun and Mercury officially conjoin on Wednesday. In air sign Libra, this is good for mental work, especially creative writing and anything to do with words. Keep a notebook handy should you get a sudden flash of inspiration. On Thursday, Venus conjoins Saturn. This typically is a sober combination, but Venus rules Libra, and Saturn is exalted in her sign. It’s a perfect setup for making commitments to your friends and loved ones. No one said love – or, for that matter, friendship – is easy. It requires work, mostly because you have to be brutally honest with yourself about your motives. It’s a constant balancing act – balance being the keyword for Libra. Giving too much and resenting it later isn’t any better than taking more than your share. Compromise – another Libra keyword – is a lot harder than it sounds. Sometimes you have to overlook certain things in your loved ones, but if you do it all the time just to keep the peace, you both lose opportunities to grow. Like riding a bicycle, the point is to stay balanced while in forward motion. Before I go, I want to remind you that I start classes this week. I went ahead and posted the notice for the StarGuide forecast for October, but please bear in mind that it could take me a bit longer to respond to your requests for reports and consultations. 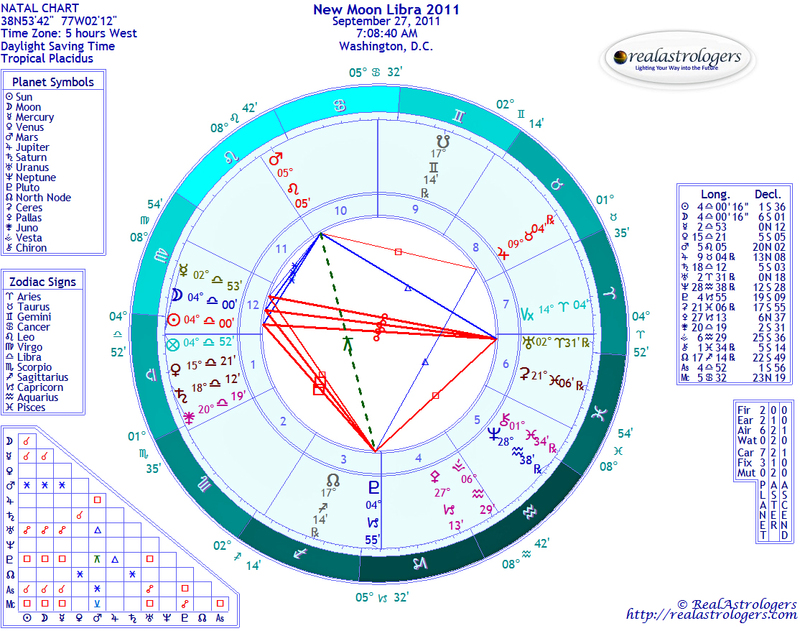 This entry was posted in Forecasts and tagged cardinal T-square, new moon in libra, Uranus in Aries, Venus conjunct Saturn on September 25, 2011 by Pat. May the stars smile upon your new path! Good luck with your classes and thanks for everything, Pat! Thanks, Kia. Just got back from my first day, and I was laughing so hard at all the screwups — just as I noted in my post. Traffic blocked at the college garage entrance because people didn’t have their new fall passes, causing a backup for several blocks. Teachers’ room keys didn’t work, so classes started late. I got put in a wrong class, but that was easily remedied and worked out vastly to my advantage!